Joe will send out further reminders for things for faculty to check before the kickoff meeting. Let’s finalize course lists at that date so we aren’t constantly requesting new stuff from Cindy Peet (manual importation of students). Add/drop will be manual; finalize at the end of the add/drop period. Review of timeline; looks good. Instructure meeting: signoff on branding, Midd KB document. KB signoff activated support: we tested submitting a support request through the interface and got a response within half an hour. Todo: enable support for importing Moodle courses. Need to find out if faculty will use it first. How do we assess the course-building process? Let’s ask ASAP after courses are built (quite soon for MIIS, by Sep 8th for Midd). Difficult to balance collecting useful data during the pilot about how well this works for Midd, vs. helping faculty use the new tool in the best possible way. Moodle and Canvas are two different tools; it’s quite difficult to compare them directly. Different features. Not just about using the tool; the focus should be pedagogy. Educational technology should be educational. If they were only going to be doing the same things they’d be doing in Moodle, there’s no point in switching. We don’t want to just throw people in the deep end as far as support goes; be available for question. “What are your goals for participating in this pilot?” (ask in e-mail before kickoff meeting, then go around the room). Help make connections between faculty of different disciplines. It’s definitely worth asking the same question more than once to see how things change over time. We can directly ask the faculty about what’s changed over time, as well. We should e-mail out a more-formal survey for mid-semester (students and faculty). We should come up with good questions by October. Joe has some letters and other communication that other students have used. Questions from MISO survey: Bill will get from Terry. Canvas’s release schedule means integration is a moving target. Stanford policy: Can’t force students to use a tool that uses personal data for a graded assignment. Has to be an option. Amy Collier has talked to Chris Norris about how to start a conversation around how we handle this at Midd. In the meantime, let’s stick to guidelines. This entry was posted in Midd Blogosphere and tagged LIS Staff Interest on September 4, 2015 by Zachary Schuetz. The VPN connection between Middlebury and Monterey is seeing intermittent issues, dropping in and out. It’s being actively worked both here in Middlebury and in Monterey. This will impact all connections between the two campuses, including email and many Middlebury campus based services. We will update this post when service has been restored. This entry was posted in Midd Blogosphere and tagged Helpdesk Alert, Helpdesk Alerts, LIS Staff Interest, vpn on July 29, 2015 by Zachary Schuetz. There have been some reports of instability with the new software as compared to the 2014 editions. After updating from the CC dashboard, the license will not be recognized and the software will be in “trial mode”. This is an unfortunate side effect of the way Adobe does enterprise licensing. Mac users should go to Self Service and run “Adobe CC 2015 License”. Windows users should submit a ticket with the MIDD number (on the blue sticker) of the computer in question, requesting to have the Adobe license updated. If you have any questions, please contact the Helpdesk at 802.443.2200 or helpdesk@middlebury.edu. Thanks! This entry was posted in Midd Blogosphere and tagged ITS, LIS Staff Interest, Post for MiddPoints on July 7, 2015 by Zachary Schuetz. The MiddleburyCollege network went live on Tuesday, and devices of all kinds have been connecting successfully since. However, we want to give people more time to make the switch, so we will not be removing midd_secure on Monday but rather on the morning of Wednesday, March 11th. We anticipate that Midd-standard will be removed the following week as planned, with a possible delay of one to two days to allow time for those who need to move to the special MCPSK network that will be introduced on Wednesday. Again, in this case it is safe to continue connecting – the certificate is valid, but some devices do not recognize it by default. This is misleading; if you click Close and wait 1-2 minutes, the connection should complete successfully. 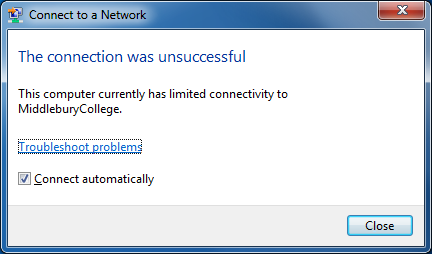 If you are unsuccessful in connecting to Middlebury College after a minute or two, we suggest rebooting your device and trying again. Any warnings should only appear once – after that, your computer or device should save the configuration settings and reconnect quickly and smoothly from then on. As usual, please direct specific issues to the Helpdesk; broad questions should be asked here so everyone can benefit from the discussion. This entry was posted in Midd Blogosphere and tagged LIS Staff Interest on March 6, 2015 by Zachary Schuetz. We are currently experiencing network difficulties in the Center for the Arts. We are on the scene and the problem will be resolved as quickly as possible. This entry was posted in Midd Blogosphere and tagged Helpdesk Alerts, ITS, LIS Staff Interest on January 23, 2015 by Zachary Schuetz.